Once you've made your first wall dive in Melbourne, you'll be hooked. Our coral and sponge covered underwater walls are some of the coolest dive sites, and are filled with sea creatures big and small. Tucked into the coral and sponge plastered beauty of these vertical reefs are a host of underwater creatures that like to shelter in the nooks, crannies, ledges and small caves that punctuate the drop-off. Turn your attention away from the wall and look out in the blue, where there's the chance of seeing the unexpected — from sharks to large schools of fish. Snapper can often be found in open water. Safety Tip: We recommend you read our Boat Diving Safety and Using a Dive Float and Flag pages and use the described Cray/Drift Buoy Line Diver Freedom System when wall diving from a private boat. 12lb Reef is located on the Lonsdale Wall, inside Port Phillip. It was named after a massive crayfish that was caught there. The story goes that a cray diver caught site of the monster in its cave, and grabbed it. Maybe it's more accurate to say that the cray caught him! By the time he reached the surface, the two were still locked in a mortal struggle! Nevertheless, there could well be more large crays still lurking here, so if you fancy your skills as a cray hunter it's definitely worth a look. The many overhangs and plentiful soft corals make this a popular and picturesque dive as well. Depth: 8 to 20 m.
16lb Reef was supposedly home to one of the biggest crays ever seen around Port Phillip. Originally spotted by a cray diver who was unable to reach it, the cray remained the stuff of legend until its existance was confirmed several years later. As far as anyone knows it is still there. 16lb Reef is located on Lonsdale Wall, near the heads, inside Port Phillip. There are many overhangs and small dropoffs, with a wide variety of fish including the spectacular Blue Devil. Bum Rock on the western side of Dannevig Island at Wilsons Promontory is hard to miss. The massive smooth granite boulder has a large crack in the centre, causing it to look just like its name. The crack continues underwater and inwards about 10 metres down to the boulder covered bottom. The depth here is 30 plus metres, and the site can be subject to very strong surge, so be very careful. Captain Nitro Drop Off (aka The Drop-Off) is located on the Western end of Spectacular Reef, and consists of a series of walls that plunge to over 60 metres in 5 to 10 metre increments. This makes it a great dive for advanced levels. Huge boulders the size of houses are scattered over the area, lying where the ancient Yarra River deposited them. Midwater, large fish can often be spotted as they make their way into the bay, and if you are lucky seals and dolphins are also occasional visitors. Diving Captain Nitro's Dropoff from Alan Beckhurst on Vimeo. Depth: 16 to 60 m.
The Dannevig Island North East dive site is at the North East tip of Dannevig Island in the Glennie Group of islands at Wilsons Promontory, Victoria, Australia. The dive site is between one rock that is exposed at low tide and another rock under about 5 metres of water just to the south of it. The steep slope of the rocks goes down to about 15 metres. Then there are massive boulders going down to 25 to 30 metres deep. These form fantastic swin throughs. But the highlight of this dive site is a large cave at about 25 metres down close to the northern tip of the island. There are a few entrances to the cave and its also great fun exploring the numerous swim throughs in the area. This spectacular dive site is simply one of the best you can dive anywhere in the world. Depth: 10 to 30 m.
Devil's Drop Off (aka Devil's Dropoff) is one of the most popular dive sites on Lonsdale Wall, this site begins with a huge drop-off from 12 to 30 metres and continues with a series of ledges, overhangs and swim throughs and then gently slopes to 55 metres plus. This is also the habitat of the Southern Blue Devil fish which can be spotted all along the wall here. Their placid nature and vibrant blue colour also makes them great for photography. You will also come across many other species of marine life here as the site lies in the Marine Park. At 27 metres there is a long overhang to follow covered in a large variety of soft corals and small fans. A spectacular dive site with something for everyone. Source: Unknown. Believed to be incorrect coordinates. Depth: 12 to 55 m.
At the very Southern end of the Lonsdale wall system sits Foggy Reef. As you may have guessed this site was named as the fog rolled and this amazing part of the wall was found. The top of the reef is around 8 metres. Swimming North East from the shot you will find the edge wall, dropping over the wall you can descend to around 25 metres. From this point if you follow the wall to the south it will curve around to the East. About 20 metres from where you go over the edge there is a huge old admiralty anchor embedded in the wall. You will need to look carefully though as it is encrusted with the same colourful growth as the wall. Directly opposite this site lying in the sand are two old cannons. Unfortunately the sand movement in this area means that sometimes the cannons are buried. After you have had a look around, turn back the way you came and follow the wall North for the rest of your dive. Check out the amazing overhangs undercuts and the colourful soft corals and sponges that are prolific in this area. It also goes without saying to note the fish and marine life attracted to this terrain. Depth: 8 to 30 m.
Inner Corsair Wall is a very spectacular wall dive with lots of ledges, caves and drop offs. The top of the wall starts at 10 metres and bottoms out at over 60 metres. The wall is a good cray spot and good crays have been caught at 38 metres. Inner Corsair Wall can only be dived on slack water as it is only just out of the heads. Although shipping does not normally transit this area, it's technically still in the shipping channel. Depth: 10 to 60+ m.
The Swim Through, by Jane Headley. Located just inside the heads of Port Philip Bay on the Lonsdale side, Lonsdale Wall is an underwater canyon formed by the old Yarra River as it flowed out through the plains carving steep walled edges out of soft rock sides before the sea levels rose and the Bay flooded many years ago. Lonsdale Wall extends for 1 km, therefore providing many different sights to dive. An almost vertical drop characterizes Lonsdale Wall. With overhangs and ledges and undercuts providing sanctuary to an enormous variety of fish including the spectacular Blue Devils, Leather Jackets, Magpie Morwongs, Hula Fish, Old Wives plus Crayfish and Cuttlefish. Occasional sightings of a Port Jackson snoozing under a ledge, or and if you are really lucky you may even spot a Wobbygong or Broad Nose Seven Gill Shark cruising slowly along the wall. Colourful growth in the form of soft corals, sponges, hanging sea fans in bright yellow, orange and other varieties in pink and burgundy. At least four different Nudibranchs and Seastars can be found here is you look closely. As you descend there is a slight step out every 6 to 9 metres or so, and behind each step-out there is a huge overhang. Shining a torch under these ledges will reveal a myriad of life and colour, with sections carpeted in yellow zoanthids like a field of yellow daisies. Lonsdale Wall from Alan Beckhurst on Vimeo. Depth: 12 to 38 m.
Lonsdale Wall Shallow is a shallow section of Lonsdale Wall mostly used by charter boat operators to introduce Open Water rated divers to a more appropriate section of the wall given their limited experience and depth limits. While a nice dive with plenty to see, it's no substitute for a dive on the more spectacular parts of Lonsdale Wall. 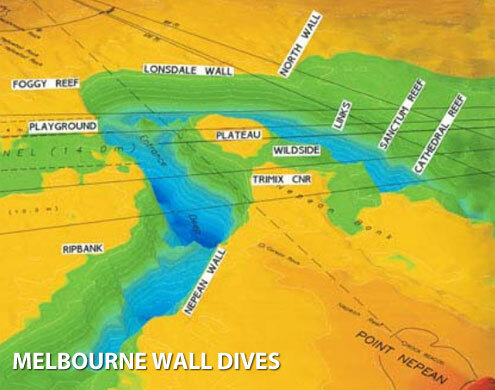 Depth: 12 to 25 m.
Nepean Wall runs East to West just outside Port Phillip Heads on the Point Nepean side. To go over the wall you swim South from the shot. Descending to your desired depth you can swim in either direction along the wall, but it is important that you return to the shot for your ascent as the current here turns very quickly. It is also a good idea to keep your bottom time shorter on this dive. This dive is only done on the ebb turning to flood so that at the end of your dive the current will bring you back into Port Phillip. The wall along here is amazing with lots of soft coral and sponges but slightly different coverage than the Lonsdale Wall side. The odd Crayfish is collected here too. The fish life is amazing and this quite often brings Seals into the area. Depth: 18 to 65 m.
North Wall is located on Spectacular Reef between the Captain Nitro Drop Off and Spec Reef dive sites. The top of the wall is in about 19 metres and the wall drops of to over 60 metres. The wall has large overhangs, small caves, swim throughs and lots of crevices to explore. At the top of the wall Crays can be found. North Wall is a slack water dive and it is also in the shipping channel. You cannot anchor and you must get a shipping report from Point Lonsdale or the Seapilot Station prior to diving. This site is diveable in most weather conditions, however big seas will reduce viz to a couple of metres. Depth: 19 to 60+ m.
North Wall Corner is is an amazing dive, situated at the Northern end of the Lonsdale Wall in Port Phillip. Lonsdale Wall runs South to North, and at this point it turns and runs West to East. Here in the corner the current has scoured quite a deep area. The walls tower vertically here with amazing splits and overhangs sheltering an amazing variety of soft coral and sponges. Generally this dive is done on Slack Water at the end of the Flood so that it's at its clearest. In this dive it is best to swim along the East West wall first and then return onto the North South wall before the current picks up. Depth: 22 to 66 m.
Outer Corsair Wall can only be dived on slack water as it is only just out of the heads. Although shipping does not normally transit this area it is technically still in the shipping channel. Paradise Wall is located on the Lonsdale side of Port Phillip Heads, and is a great dive site on Lonsdale Wall. It's the shallowest part of the wall with the drop-off starting in 10 or 12 metres, starting with a couple of steps then dropping fairly steeply. If using transits, line up the big pine up with the notch in the treeline behind Lonsdale. We believe this might be an old Dive Experience site from the Calypso and Corsair days! Party Point is located on the Lonsdale side of Port Phillip Heads, and is a dive site on the Lonsdale Wall which extends for 1 km, therefore providing many different dives. An almost vertical drop characterises the Party Point dive site as the wall extends out to form a large point. As you descend there is a slight step-out every 6 to 9 metres, and behind each step-out there is a huge overhang, which is easy to swim through. These overhangs support an enormous variety of fish including the spectacular Blue Devils, soft corals, sponges and other invertebrate life. This is a slack water dive and not subject to shipping. While technical divers can reach a depth of 45 metres at Party Point, there is plenty for an Open Water rated diver to see down to 18 metres, and for an Advanced Open Water rated diver to see down to 30 metres. Depth: 12 to 45 m.
Portsea Hole is inside Port Phillip Bay about 500 metres (1,640 feet) from the Portsea Pier and is a remnant secion of the drowned valley of the Yarra River. 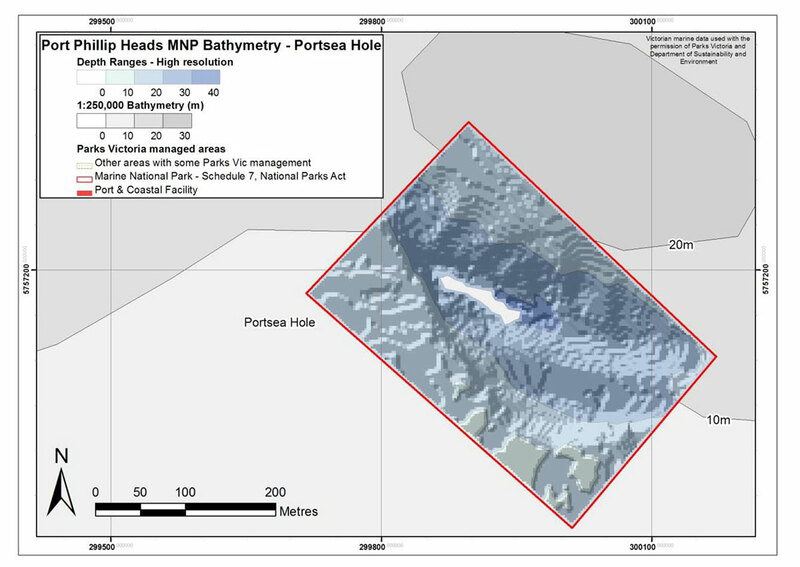 The surrounding seabed marks the top of Portsea Hole at 12 metres (39 feet) and to the North there is a vertical wall approximately 75 metres (246 feet) long which drops to sand at 27 metres (89 feet), then into a sand bowl which bottoms at 33 metres (108 feet). Portsea Hole is a remnant section of the Yarra River with calcarenite vertical reef. Its moderately exposed, vertical and sloping reef is orientated east in a natural amphitheatre. It consists of rocky ledges and outcrops on the western side of a sandy bowl or hole. 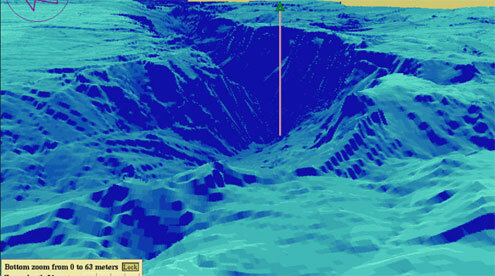 At the top of the hole there is a largely flat area with very low steps (0.5 m) and a few rock bombies. This area is covered by patches of sand and algae. In the hole there is a narrow strip of vertical reef wall and ledges at 22 metres (72 feet) depth, approximately 2 metres (6.6 feet) high and 20 metres (66 feet) long, which supports mostly sessile invertebrates. There is also a small area of rocky outcrop at 27 metres (89 feet) depth interspersed with sand. On the wall algae grows on horizontal reef surfaces, and is limited by low light from the overhanging ledges. Portsea Hole is characterised by diverse and abundant fish assemblages as well as a rich benthic community of marine invertebrates, encrusting algae, sponges and soft corals. The wall comprises small overhangs, which are home to a vast array of invertebrate life and fish, in particular the beautiful Blue Devil fish. On the top of the hole there are several rock Bommies that host hundreds of fish of many species. Vertical sections of Portsea Hole support a high abundance and diversity of sessile invertebrates, including sixteen different types of sponges such as arborescent, flabellate, encrusting and massive sponges. Massive ruffled sponges can be particularly abundant on the reef. The relative dominance of sponges can change over time. Portsea Hole has a high abundance and diversity of fish species including barber perch, southern hulafish and silver sweep. Other commonly seen fish species include the blue devil fish, butterfly perch, jackass morwong, gurnards and goat fish. Portsea Hole has moderate exposure to waves and currents. It is best dived at slack water. Portsea Hole is is a very popular boat dive site for recreational scuba diving activities. More than one Melbourne diver has had their first taste of scuba diving from a boat here. Depth: 12 to 33 m.
Mean water temp - summer: 18.4°C. 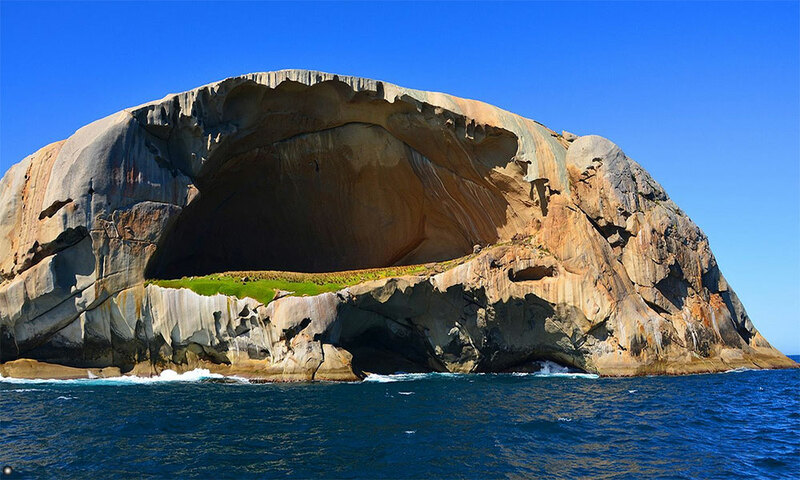 Ramsbotham Rocks is located on the north east tip of Great Glennie Island, which is the largest island in the Glennie Group at Wilsons Promontory, Victoria, Australia. It's a sheltered spot to dive, especially if there is a south easterly wind blowing. The dive site features interesting rock formations and large boulders with caves and swin throughs. The rocks slope down to a sandy bottom at around 30 metres deep. A fantastic underwater cliff just outside Port Phillip Heads on the south east side. The currents through here dictate this dive only be conducted on a slack water at the end of the flood tide and even then only when conditions are calm outside the bay. The passage of the current here runs along the wall and can be extremely fast. There are a lot of Crayfish to be caught along the top of the wall. The wall itself is very steep with large overhangs and beautiful colours. The other great thing about this dive is that almost every dive somebody gets to see Sharks swimming along the wall. They do tend to swim about 10 to 15 metres from the wall and just cruise past checking things out. The sharks are Seven Gills and are listed as harmless. They look a little like Grey Nurse Sharks and can grow up to 3 metres long. Skull Rock (or Cleft Island) forms part of the Anser Group of islands southwest of Wilsons Promontory. The sheer granite rock formation and caves that rise some 113 metres above sea level look skull like from a distance. The rock formation continues 40 plus metres underwater and makes for awesome diving. There are underwater caves and playful Australian Fur Seals often come to see divers here. Because of the depths that can be reached here, plus the sometimes strong currents, Skull Rock is best dived at slack water. Spot G, by Jane Headley. Named after a local diving identity, the Spot G dive site is remarkably hard to find. Some even say it doesn't exist, but it does. It's a stunning part of the Lonsdale Wall cliff system. The wall here runs North to South with deeper water to the East. The wall has some huge splits or cracks in the area with a few pieces having broken away from the wall itself. This is wall diving at its best. Lots of fish and some incredible colours make this photographer's heaven. Depth: 20 to 40 m.
As the name The Cave would suggest, the highlight of this dive is a large cave big enough to drive a small truck into. The Cave is at 30 metres on top of a wall that runs East West with deeper water to the South. The dive site is in the shipping channel and should only be dived when there is no shipping and only at slack water at the end of an ebb or outgoing tide. 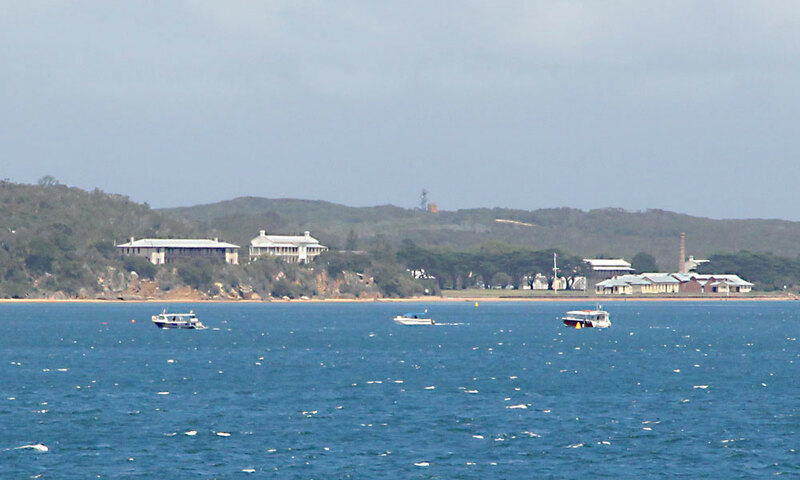 The Far Side lies halfway between Shortland's Bluff and Point Nepean and it sits inside the shipping. The Far Side is a fantastic wall dive. The wall runs from East to West with the very sheer wall drop-off to the North. Some fantastic rock formations can be seen on the wall along here, as can Crayfish and a massive amount of other fish. Can be dived during slack water only. Depth: 20 to 60 m.
The Links is named for a massive anchor chain lost from the Japanese freighter the Ningan Maru in the late 1980s. The vessel suffered a steering failure just inside the Heads and with the strong incoming tide was quickly pushed towards the shoreline at Shortland's Bluff. The pilot gave the order to drop the anchor in order to prevent the vessel being driven ashore. Later when the problem was rectified the anchor chain had become fouled on the seabed and was unable to be recovered and was cut free. Today the anchor chain hangs like a necklace draped over the wall and over Bommies as it drops from 18 metres to 60 metres at the bottom. The chain is now overgrown in beautiful sponges and is a fantastic sight. Depth: 18 to 60 m.
Located just inside the heads of Port Philip Bay on the Lonsdale Wall system, The Mall is part of the underwater canyon formed by the old Yarra River as it flowed out through the plains carving steep walled edges out of soft rock sides before the sea levels rose and the bay flooded many years ago. An almost vertical drop characterizes the site with overhangs and ledges and undercuts providing sanctuary to an enormous variety of fish including the spectacular Blue Devils, Leather Jackets, Magpie Morwongs, Hula Fish, Old Wives plus Crayfish and Cuttlefish. At least four different Nudibranchs and Seastars can be found here if you look closely. Depth: 15 to 45 m.
Another great place to see crayfish that is situated right in the middle of the shipping channel just outside Port Phillip Heads on Rip Bank. The location of this dive site makes it only suitable for experienced divers. The Rip Bank is a wall that runs East to West with deeper water to the North and as such is only suitable to dive on the end of the incoming or flood tide. Depth: 15 to 50 m.
Total of 28 dive sites. I breathe underwater. What's your superpower?